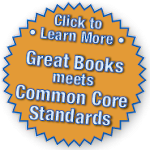 At the beginning of the school year, I wrote a blog post concerning the Common Core State Standards' focus on supporting ideas with evidence. That post stayed on mind as I worked in K-5 classrooms the past nine months and I found myself paying close attention to the way students develop the ability to use textual evidence to support their interpretations of texts. My very informal observations left two distinct impressions. First, I see a distinct progression in the way students develop the ability to use text-based evidence to support their interpretations of text within and across the grades. And second, I realize that skilled and flexible teachers can use questioning to greatly strengthen students’ ability to use evidence. In this questioning stance, just as the Common Core standards demand, students do the thinking, while teachers use questions to stretch and scaffold. The following chart illustrates the types of questions teachers can use to promote students' effective use of evidence. Clearly articulate an idea about text. Can you help me understand what that means? Recognize when ideas come from the text and when ideas come from outside the text. Did that happen in our story? What did you think when that happened in the story? Identify the approximate place in the text where the idea originated. Did you start thinking about that in the beginning, middle, or end of the story? What did the character say or do that helped you decide that? Cite specific quotes from the text to support an idea. Which words helped you decide that? Articulate the connection between relevant evidence and interpretation. Can you help me understand how that supports your idea? Explain the logic of their evidence. Does that hold true throughout the text? If you are saying that, how do you explain what happens here? Weigh the evidence for alternate interpretations. Is your interpretation as well- supported as this other possibility? While much of this is intuitive, this progression and the recognition that students move through it in different ways and at different times, inform how we can strengthen students' use of evidence not only in Shared Inquiry but also in other contexts through the flexible and strategic use of questioning. In addition, it suggests that teachers can build the foundation for this skill in the earliest grades and continue to develop it by meeting each student where they are in that moment and guiding them toward the next level. This article was very helpful and clear. I have worked for Great Books for years and still learn from our teachers and trainers. Thanks.